Criticizing moon race with Russians. The battle for the moon. STRANGELY ENOUGH, NASA – ordered by President Eisenhower to forget all about a moon landing – was able to produce fully detailed plans that not only showed that a moon landing was indeed possible, but also that such a landing was the only space project that would offer the opportunity to gain an advantage over the Russians. In these plans, the year 1967 and not 1969 is stated as the year for the landing. However, this proposal was not based on convictions regarding technological progress as such, but on the fact that 1967 marked the 50th anniversary of the October Revolution (1917) and would, therefore, be a year that the Russians would gear their space flights towards. Wernher von Braun chose this very appropriate moment to address Vice-President Johnson in writing. He wrote that landing on the moon would be possible in 1967 and offered plans to facilitate such an endeavour. NASA, it turned out, disagreed with him and stated that the priority given to the moon plan had not prevented NASA from continuing with a balanced space program. “Choose any (the less, the better) of our highest national priorities and choose those elements that can be regarded as directly contributing to this goal. Be cautious where the other elements of our national space program are concerned.” After NASA’s response, the Pentagon followed. Hardly anyone paid attention to the irony that a peaceful space program required the help of the same armed forces the civil space agency had fought such bitter battles with. This was a matter of national emergency. Despite the growing arsenal of nuclear missiles, this seemed to concern the very core of national security. Johnson ordered the Air Force to reconsider its rich collection of rejected space projects. The letter, which President John F. Kennedy on April 20, 1961 sent to Vice President Lyndon B. Johnson, in which he ordered to pursue the American lunar research with vigor. Copyright The Sunday Times. CLOSER TO HOME, Kennedy’s own closest scientific advisor, MIT’s Jerome Wiesner, was very critical of NASA’s moon plans. 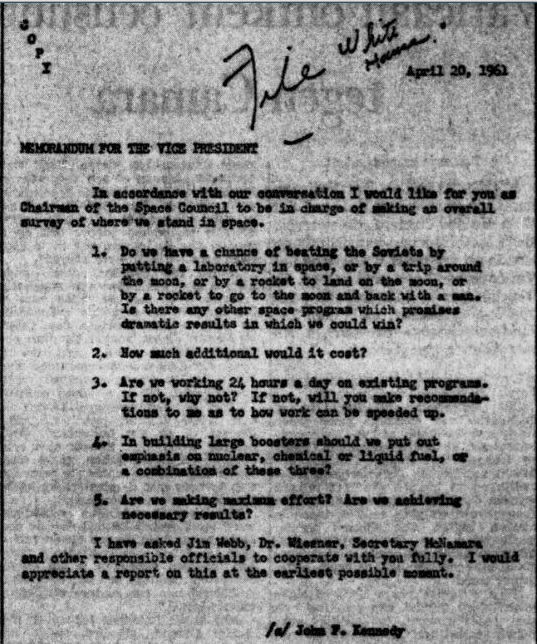 Even before Kennedy had been formally inaugurated, Wiesner had convened a committee to advise on the space plans, as requested by the President. This committee concluded that the current program to deliver people into orbit was wrong and that it was very unlikely that these plans would lead to actually doing so. Wiesner, who returned to Massachusetts, now describes his report as “an attempt to distance myself from the space race. It was obvious that we were not going to win that race and I wondered if it was worthwhile to enter into it. In view of the resources required and the manpower, we saw it fit to give a negative response to that question.” Wiesners influence on the events that ensued later was limited, but not meaningless. It sheds a somewhat harshly realistic light on the moon program. 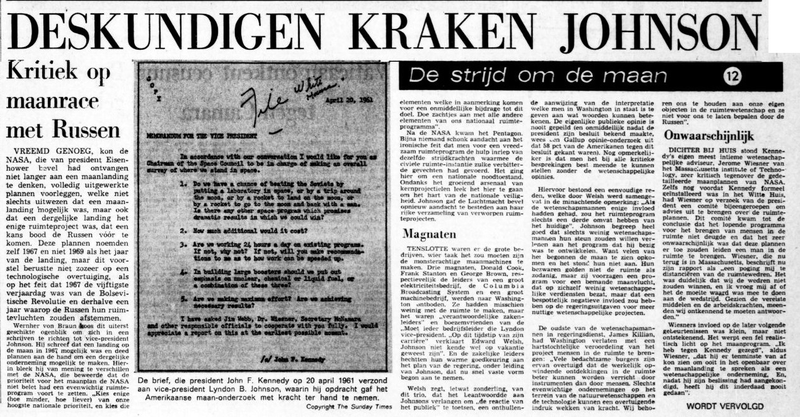 “I told Kennedy”, Wiesner said, “that he should at least refrain from speaking publicly about the moon landing as a scientific endeavour and after he announced his decision he has actually never done so."